Presidential candidate Anthony Jones was officially disqualified from the 2019 Student Government Association election Thursday morning. 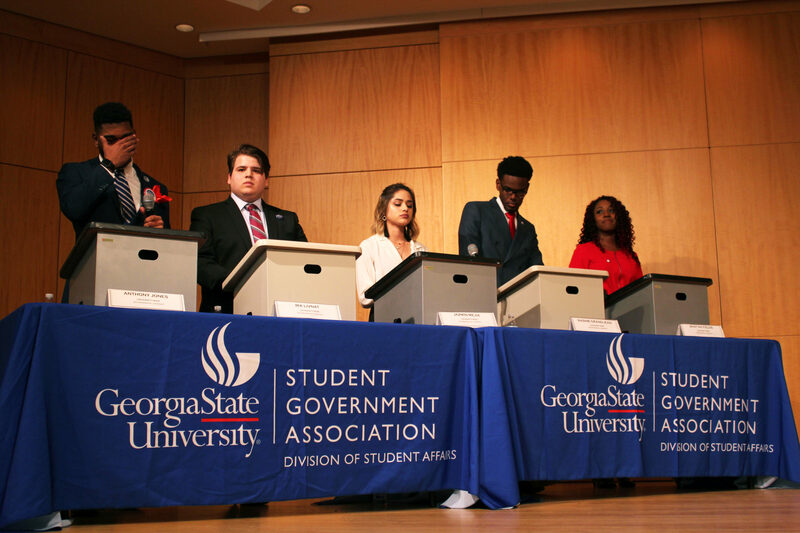 The SGA Election Commission delivered the verdict after hours of deliberation behind closed doors yesterday. The decision was made in response to an official election complaint filed Wednesday by student Shaquille Johnson in which Jones was accused of breaching campaign ethics rules. At the same time, The Signal published an article in which sitting Executive Vice President Aarjavi Patel alleged Jones attempted to bribe her to vote for him back in January. The Commission ultimately agreed with Johnson’s complaint, eliminating Jones from the race on the grounds he violated article 6, point B of the Election Code. “Candidates are expected to conduct themselves in an ethically appropriate manner in accordance with SGA documents and the Student Code of Conduct,” the code states. Last night, Jones was hit with another election complaint. Sen. Kenneth Lockett accused Jones of campaigning while suspended after seeing him discuss his personal record and the election in the “GSU Class of 2022” GroupMe chat yesterday evening. The Commission agreed with that complaint as well, doubly disqualifying Jones and all but guaranteeing a path to the presidency for his opponent, Jazmin Mejia. In an interview with The Signal Wednesday afternoon, Jones denied Patel’s allegations that he bribed her. He also said he wished there had been more notice that he was under active investigation by the Election Commission. “I was not consulted at all or given any notice … there was going to be an investigation. It is terrible to me at least that I have to read in the newspaper that I am being investigated,” Jones said. He also pointed to what he considered to be inconsistent accounts on Patel’s part. “The direct deposit — that was not sent by me — was for $159. She gave me back $75,” he said, referring to when Patel told The Signal she had received $100 through Venmo and then returned it to Jones. Patel said she returned the money because she hadn’t agreed to any transaction with him. Jones said he’s had Patel’s $75 for months and would eventually like to return it to her. Jones has since appealed both of the Commission’s verdicts. The issue will now be brought to the Student Judicial Board, where a three-person committee will make the final decision on whether Jones remains in the race. According to Chief Election Commissioner Jessica Siemer, Jones’ ethics violation has also been referred to the Dean of Students office. The runoff ballot was sealed between Mejia and Jones yesterday at 5 p.m. The Election Commission began deliberating on whether or not to disqualify Jones yesterday around 1:30 p.m., but they did not make a decision before the 5 p.m. deadline. Several things would have had to occur for Jones’ runner-up to replace him on the runoff ballot. First, he would’ve had to have been disqualified by the Commission. Then, he would’ve had a chance to appeal that decision to the SJB. Finally, the SJB would’ve had to uphold the Commission’s ruling — all before 5 p.m. on Wednesday. “This current situation is tough, but we owe every candidate due process, and can’t rush investigations and decisions because of deadlines,” Siemer said. Presidential candidate Ira Livnat, who lost the general election and has since pivoted to support Mejia’s campaign, weighed in on Jones on Twitter yesterday. “As a former candidate, it is absolutely gut-wrenching to learn that one of the reasons you didn’t make the cut was because you campaigned fair and square instead of buying votes,” he said before endorsing Mejia. Unless the SJB overturns both of Jones’ recent violations, Mejia is on track to automatically win the race and become the first Latina SGA president in university history. She previously led the general election by 10.9 percent, though she was 4.1 percent shy of the 15-percent margin over her runner-up needed to avoid a runoff election. The official vote count for the runoff election will be announced on Monday, April 8 on Twitter. Update (04/05/2019): This article was updated to correct minor supporting details, such as that the Election Commission began deliberating around 1:30 p.m. on Wednesday, not 3:30 p.m.